Complement your look with refreshingly luxe and contemporary cool headpieces. Make heads turn on the field with Heather McDowall. Based in Sydney, the label perfectly balances designer luxury with effortless style. Timeless designs meet trend through bonded leather and dramatic floral pieces. Encapsulating the racing spirit, her millinery is all about confidence and being fearless to stand out. Simply jaw-dropping, elevate your race day style with a fascinator from Heather McDowall. If you’re going for something bold, opt for sculptural leather that spirals in gorgeous formations. For something a little more sweet and feminine, floral lace veils with structured sinamay hats are your go-to in pastel shades. No matter what your style, there’s something for everyone. Read our blog post for more tips on how to wear race day fascinators. 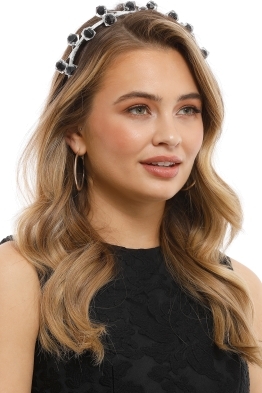 I rented this head piece to wear with a feminine floral dress to the Races. It was an incredibly easy headpiece to wear & it was very comfortable. I had so many complaints about it and people wanting to know where I got it from. This is such a beautiful piece to wear. Beautiful fascinator- perfect for the races! I wore this gorgeous fascinator to the races last week. As it's a headband, it's easy to put on and it stayed in place for the whole day. I wore my hair out with loose curls. I received lots of compliments! I wore this to Melbourne Cup. Understated without being boring. Would compliment both an edgy or more classic look. Stayed comfortable throughout the long day! Why buy when you can hire!? The most beautiful headpiece I ever did see! Heather McDowell is an incredibly talented designer and as soon as I took this out of the box I knew it was going to be perfect ! Comfy - and the easiest to pop in my hair (I even had extensions in and it didn’t stuff them up !) It was dainty yet pretty ! The third year in a row I’ve hired my derby headpiece from GlamCorner and hands down this was my fave !! 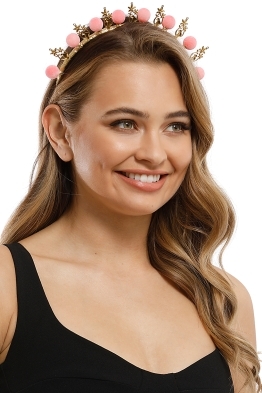 I rented this headpiece to wear to a Spring Racing event, on the recommendation of one of the Glam Corner staff, when I told them what I was wearing via live chat. I couldn't have been happier with it - it wasn't too tight, was beautiful and elegant without being over the top, and I had lots of compliments on the night. Would highly recommend for the Spring races. I wore it with a red and black dress, and it complimented it really well. So easy and comfortable to wear! I rented this headpiece to wear to a Polo event with the Talulah Indira dress. The headpiece was stunning. Very delicate and feminine. It was comfortable to wear for the duration of my event.